NotifySnack is an incredibly useful application that allows you to create beautiful, smart notification bars for your websites and blogs. NotifySnack is an incredibly useful application that allows you to create beautiful, smart notification bars for your website. Being so highly customizable, it will integrate perfectly with the general feel of your web page and grab the attention of your visitors without annoying them. 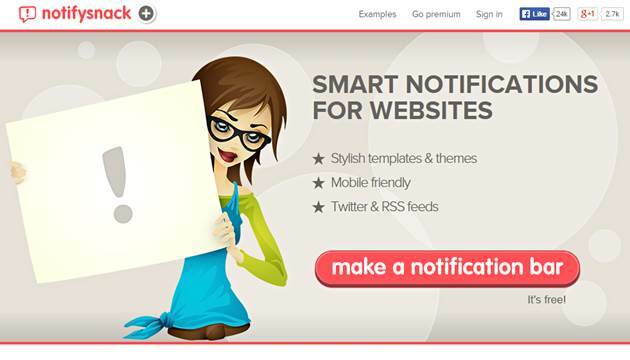 You can use NotifySnack to simply say hello to your visitors, drive them on landing pages with high conversion rates, increase your subscribers list, sell products, promote anything or even display Twitter or RSS content. NotifySnack is designed keeping mobile users in mind so they made sure the notification bar would work great on any screen size.